Not all forms of abuse can be perceived with the naked eye. Certainly, certain forms of physical abuse and neglect are relatively easy to spot, if one knows what to look for. But mental, emotional and financial abuse do not appear on a person’s body in ways that are easily perceived. As a result, one needs to know the signs of non-physical forms of abuse in order to protect oneself and one’s vulnerable loved ones. Unfortunately, residents of nursing facilities are too often targeted by those who would mentally and/or emotionally abuse them if given the chance. If any of your loved ones live in nursing care facilities, please learn these signs. And should you ever suspect that your loved one is being emotionally abused, please contact a Fairfield County, CT elder care lawyer immediately. Understandably, many loved ones are hesitant to “sound the alarm” in regards to emotional abuse if they cannot easily prove that it is occurring. Oftentimes, it may be difficult to determine whether it is occurring at all. This is partially why it is important to learn the signs and to contact a Fairfield County, CT elder care lawyer if you are at all suspicious that your loved one is suffering from emotional abuse. Attorneys experienced in this area of law understand how to get answers and how to respond if/when abuse is occurring. If you suspect emotional abuse, know that your loved one is not alone. Widespread statistics suggest that as many as one in every three nursing home residents suffer abuse while living away from home. If your loved one seems unusually agitated, fearful, hesitant to remain in the presence of a certain individual, sad or nervous, do not be afraid to consult with an attorney. There may be a perfectly good explanation for your loved one’s state of mind, but as emotional abuse is so common (and its victims are seldom able to communicate about their experiences freely for a myriad of reasons), it is important to seek legal guidance from a Fairfield County CT elder law lawyer rather than looking the other way in the event that there is not a perfectly reasonable explanation for your loved one’s distress. If you suspect that a loved one may be suffering emotional abuse while residing in a nursing facility, please do not hesitate to contact a Fairfield County, CT elder care lawyer today. Just because it is often more difficult to discern whether emotional abuse is affecting a residential care facility patient then it is to discern physical abuse or neglect does not mean that this kind of abuse should be treated with anything less than urgent attention. The experienced team at Sweeney Legal, LLC will help you to get answers about your loved one’s situation. If your loved one is being abused, we will help to support you and guide you through your legal options. Should you choose to pursue legal action, we can guide you through that process as well. If your loved one is suffering as a result of emotional abuse, he or she is unlikely to be able to adequately advocate for himself or herself at this time. You may need to act on behalf of your loved one, but you do not need to do so alone. 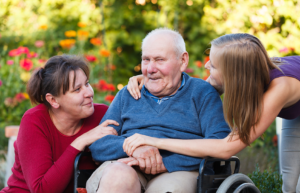 An experienced Fairfield County, Connecticut elder care lawyer can help.